It may be helpful to view the infomercial above. It will provide you with a visual aid and some basic information on the system and training and answer some of the more common questions we are asked by our customers. 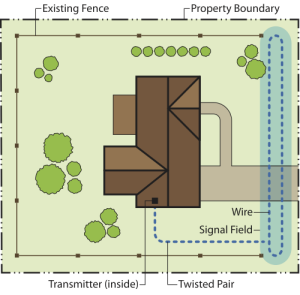 The DOG GUARD Out of Sight Fencing system is state of the art and uses a unique digital radio signal. This technology is used by the manufacture to prevent the electronic receiver being turned on by the many other signals which control cable tv, telephones, garage door openers, ect. As important as it is to have a great pet fencing system, your dog fence can fail if it is not installed professionally. Our professional installers will use equipment which is designed to bury a direct burial wire underground and to a depth which keeps it out of harms way from aeration, edging, and general yard maintenance. This heavy duty wire will create a safety perimeter, based on your input and needs, designed by you and your DOG GUARD dealer. A small receiver is fitted around your dog’s neck. This receiver works exclusively with the encoded signal which is transmitted by the transmitting unit (usually located in your garage, or other convenient area). As your dog approaches the barrier, the dog fence receiver will deliver a predetermined stimulus which you the owner control. If your dog advances further, a second barrier produces a predetermined correction. The amount of stimulation will be determined by your dogs sensitivity and tolerance for pain. Your dealer will work with you to fully explain the settings and what is appropriate for your dog to prevent break outs. It is important not to scare your dog to death but at the same time prevent your dog from escaping your yard. Our company motto is “100% pet containment” for as long as you have your pet. Each installation is customized, and you define the boundaries. Your dealer will listen to what you want, answer questions, and make suggestions. 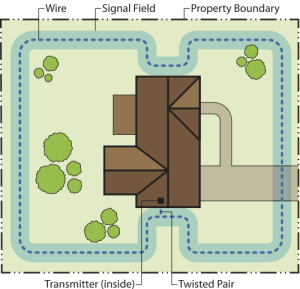 Most people will have their electronic pet fencing system for 10-15 years so you may want to take into consideration driveways, flower beds, pools, and other areas which you may not want your dog to have access to. The DOG GUARD System can easily be modified if you later choose to exclude certain areas such as decks, heating and cooling units, or anything you wish to protect from a pet who chews or digs or disrupts certain areas. Reliable products. Guaranteed results. That’s the DOG GUARD promise. The manufacturer of the DOG GUARD Out of Sight Fencing is located in New York and all its products are manufactured and assembled right here in the United States. By building the equipment here in America the company is better able to adapt to new technology and eliminate poor workmanship. The DOG GUARD Out of Sight Fencing systems are known for their high quality and dependable products. We believe our products and services are the best in the world. Our transmitters and receivers are thoroughly tested before they are shipped to the nationwide network of dealers, and are so well made and reliable that a lifetime warranty on the equipment excluding abuse or neglect is provided free of charge. To give you a feeling of security and confidence in your dog fence system DOG GUARD of New York provides a 30-day unconditional money back guarantee, valid from the purchase date of your equipment. In addition, DOG GUARD South Carolina offers an additional warranty, thus offering a no risk guarantee that if your pet cannot be fully contained within the first 90 days, the full purchase price of your system will be refunded. All we ask is that you allow us to work with your pet. DOG GUARD® Out-of-Sight Fencing® is safe and affordable, thus providing you with an alternative to traditional pet fencing. Furthermore, your system is backed by a local dealer with over 22 years of experience and a record of containing over 4,000 pets. 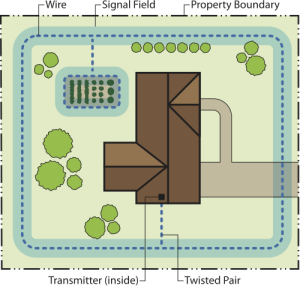 The area(s) of containment is determined by the signal wire which is buried underground and the training begins by placing boundary flags just inside the signal field to provide a visual aid for you and your pet. Your dealer will design a training program for you and your dog based on your dogs personality, age, size, and sensitivity or resistance to pain. The owners input is taken into consideration on how we approach the training of your pet. We refer to our training program as (ESP). (E) stands for education, (S) for stimulation and (P) for practicing what we teach. In most cases, we can have your pet comfortably confined within the boundaries of your yard with 3-5 days. Your dog will need to (P) practice and be carefully observed for a period of time which will be determined once we work with you and your pet. We will cover our ESP program in detail.